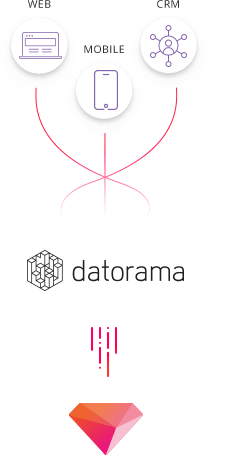 Integrate Datorama with Treasure Data and quickly optimize your marketing campaigns for maximum ROI. Truly listen to what your customers are saying to you by their behaviors. Thanks to the integration of Treasure Data with Datorama, you can hear what your customers are saying to and about you and you can act quickly to keep them satisfied and loyal. Combine data sets from disparate sources via Treasure Data. Take a look at information from Datorama blended with your LinkedIn ads results for a deeper understanding of your customers’ behavior. Use this integration to come one step closer to having your cloud, mobile, social and IoT data in one place. Knock down all your data silos by connecting Treasure Data and Datorama with a few quick steps. Save time, effort and money by having all of your marketing data in one place. Retain more of your customers by delivering what they want, be that customized offers or personalized content. Bring all of your data together in one place to perform cross-channel analysis with cutting-edge tools. Sift through tons of data and find the answers you need right now. Treasure Data can handle millions of records per second. Bring your information to life through your dashboard tool of choice by integrating with Treasure Data and your favorite BI tool. Find out how your customers are responding to your latest campaign in real time with Datorama. Leverage that knowledge to optimize campaigns for maximum impact and reach customers and retain them in the best possible way. Tap into Treasure Data to get raw data from customer channels in addition to the aggregate information from Datorama. Use granular data on your customers to see how they move between channels and better serve them. Find out who’s looking at your marketing campaign and how they’re responding to it. Forge stronger connections to your customers by developing marketing campaigns that truly speak to them. Enable the Datorama Data Connector with a simple, 3 minute setup. Analyze your Datorama data beyond what’s possible in Datorama reporting with a few lines of SQL. Get the raw, granular data that provides the deepest possible understanding of your customers for the best outcomes. Use Treasure Workflow to automate your analysis, save time and minimize errors. No more hunting for the data you need. It’s all at your fingertips, in one place. All Datorama standard data types including: region, country, business units, product groups, product, product SKU, channel, site, program, campaign, content and audience/customer segment. All Datorama custom objects including: classification changes, transformation groups, transformation rules and calculated dimensions.